NYSE listed The New York Times Company is the latest of the big daddies of global news media to bring a dedicated India page. The company has expanded its team in the country and roped in contributors for India Ink, a new sub-site that will deliver "news, information, culture and conversation" on the country. 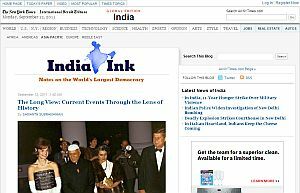 Launched last week, India Ink will bring stories and columns on topics covering politics, economy, culture and everyday life. It also seeks to be "a virtual meeting point for discussion". NYT is a $2.4 billion media house that publishes The New York Times, The International Herald Tribune, The Boston Globe, along with 15 other dailies and 50 websites, including NYTimes.com, Boston.com and About.com. India Ink will not be behind the subscription paywall in the beginning and will be offered for free, unlike the rest of the site, which requires users to pay 99 cents per month for unlimited access to the website and through its apps. It will be edited by The New York Times in India and the International Herald Tribune (IHT) in Hong Kong. "India is a vibrant country with a wealth of urgent news and compelling stories," said Jill Abramson, executive editor of The New York Times. "India Ink is an exciting expansion of The Times's global reach." The team of writers is a mix of NYT's correspondents based in New Delhi and Mumbai, expats and well known writers such as Sidin Vadukut of Mint, Nilanjana S. Roy who is ex Business Standard, film critic Anupama Chopra who also writes for Vogue India and Naresh Fernandes - a consulting editor for the magazine Time Out. "Expanded coverage of India is a natural fit for The New York Times and its global edition, the IHT," said Stephen Dunbar-Johnson, publisher of the International Herald Tribune. "We are delighted to better serve our readers and advertisers in India and abroad who care deeply about news in the region." Wall Street Journal, another international publication, also announced a new set of India columnists last week. Its India Real Time blog section offers "quick analysis and insights" with coverage of business, politics, culture, sports, and entertainment. Wall Street Journal has also enabled a Hindi version of the blog.